Honestly, I thought MTHFR stood for a bad word when I first started seeing it pop up on the internet. “Must be some new acronym kids thought of.” But when I learned that the MTHFR mutation was something pretty important and involved with detoxification, I thought I should take a second look at it. Turns out that the MTHFR mutation is pretty common (affecting about 30% of the population) and according to what my guest on today’s podcast says, many of us who have chronic health problems should probably suspect that something in this arena could be wrong. 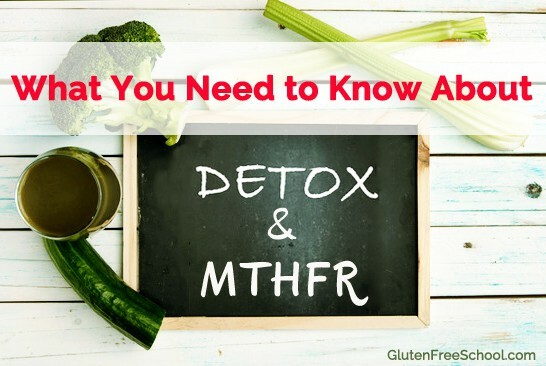 MTHFR officially stands for Methylene tetrahydrofolate reductase and to make things even more confusing… the MTHFR enzyme (what most people are talking about in regards to detoxification since an enzyme does the work) is coded for by the MTHFR gene (the gene is like the blueprint and instructions for your body to build the enzyme). If the gene gets mutated, then the subsequent enzyme that’s built would have issues functioning. Kind of like baking a gluten-free cake with out any binders in it because that part of the directions got wet and so you left those binding ingredients out because you couldn’t read the instructions. MTHFR is involved with a process known as methylation wherein a methyl group is passed around from molecule to molecule until it reaches a certain endpoint to be used for some important functions. Think of it like a hot potato, albeit an important one. And in the process a lot of B Vitamins are used to help move the methyl group around so it gets where it needs to go. As I’ve talked about before, deficiencies in micronutrients can cause some major problems because the B Vitamins used in this process aren’t optional. To be clear, this interview is much more science-heavy that the typical podcast. Hopefully this little intro will help you understand some of the conversation, but know that it’s not 100% necessary to understand every concept herein. The point of why I wanted to put this together is that much of what’s written on the MTHFR mutation and posted all over the internet on blogs is wrong and, frankly, the recommendations suggested could cause someone to get sicker. I don’t want to see that happen to you. If you have any questions on this topic or what is discussed, please let them below in the comments so that I can answer them! Jennifer: Welcome back to the Gluten Free School Podcast. I’m your host, Jennifer Fugo. Today, we are going to talk about methylation and the MTHFR gene. If you have not heard about this, then this is going to be a really great, new topic for us to talk about. If you have heard or read about it on the internet, some of the things that we’re going to discuss today fly in the face of what’s being written about methylation because some of it is, in my opinion, way oversimplified. I have a really great guest with me. She is back after talking about autoimmunity from this past August. Her name is Tracy Konoske and she’s America’s first virtual nutritionist and a different kind of dietician. She’s trained in natural, integrative, functional, and personalized medicine, and Tracy received her Master’s Degree in Nutrition from Bastyr University, and is on track to finish the Institute for Functional Medicine Certified Practitioner coursework in 2015. Tracy is successfully helping patients who suffer from migraines, IBS, joint pain and most any autoimmune disease, including celiac disease, recover. She lives in beautiful Montana, but her private practice is virtual, meaning, that you can be a patient and live anywhere. Her consultations are either by phone or by Skype and it’s super easy to get in touch with her. Tracy, welcome back to the podcast! Tracy: Thanks, Jennifer! It’s great to be back. Jennifer: Let’s just dive into this. I feel we have to figure out how deep to go here. But I want to start off with defining what methylation is, especially for those who may not have heard of that term and have no clue what this conversation is about. Tracy: So technically, methylation involves a methyl group, which is really just a carbon and three hydrogen. And that’s just chemistry, but then let’s just talk about that methylation is this metabolic process. So in our bodies, methylation makes good things happen when it’s functioning properly. Our body intuitively knows how to turn good genes on and bad genes off. Methylation happens in every single cell of our body, millions and billions of times a second. What you were alluding to, I completely agree because a lot of the big deal about methylation, I think, people think, “Oh, I need methylated folate, or methylated B12” and they don’t really know why. The big key point here, or some of the key points, are that methylation helps us in our ability to make glutathione, which is the mother of all antioxidants, and methylation is also the process that helps us make SAMe. SAMe is a superhero because when SAMe donates the methyl group, it is how we make RNA, DNA, creatine, melatonin and more. Methylfolate (which is a form of the B Vitamin Folate that has a methyl group) donates the methyl group to Vitamin B12, making methyl B12. And methyl B12 continues by donating that same methyl group to homocysteine which then keeps passing it along like a hot potato until we make SAMe. SAMe then continues to donate that “hot potato” methyl group, and that is how we make DNA and RNA and creatine, phosphatidylcholine, which is around every single cell membrane in our body. It’s how we deactivate histamine. This is how women get rid of our estrogen, meaning we methylate it and excrete it via liver detoxification pathways. It’s how we process our catecholamines like epinephrine and norepinephrine. So SAMe is super important, but he doesn’t get talked about a lot in this methylation process. If you just think about folate in food, such as something green. Let’s say you’re eating a salad or having an orange. Those contain folate and our body has to do several steps in order to convert dietary folate into dihydrofolate (DHF) and then to tetrahydrofolate (THF) in order to pass along the “hot potato” methyl group. Then we continue the conversion and turn THF into 5-methyl tetrahydrofolate (5MTHF), and then at the very end, we have “activated” folate (5MTHF) that’s ready to keep the process of methylation going. But that’s really just the beginning. Even though there were several steps to get to 5-methyl tetrahydrofolate (5MTHF), it just hands off that methyl group (it’s like a “hot potato”) to Vitamin B12. By doing so, we now have what’s called methyl B12 which then hands off the methyl group like a hot potato to homocysteine. There is a couple more steps so that we end up with methionine and then SAMe. And this happens over and over again, this whole process where folate converts to dihydrofolate (DHF) which converts to tetrahydrofolate (THF) which converts to 5,10 methylene THF (5,10mTHF) and then 5,10mTHF converts to 5-methyltetrahydrofolate (5MTHF). 5MTHF passes off its methyl group to convert Vitamin B12 to methyl B12 who joins up with homocysteine to regenerate methionine. Methionine then donates the methyl group to make SAMe. And this cycle happens over and over and over again. SAMe stores those methyl groups so we can do some really important stuff in the body. Image from Dr. Jill Carnahan’s website. Jennifer: And so for anyone who is thinking, “What? What did you just say?” And here on the right is an image so that you can see exactly what we’re talking about because to be honest with you, Tracy, unless I had written my biochem paper on this topic, I would have no idea what you just said. So for anybody who is new to this, if you’re lost, please stick with us. This actually is a really important conversation and we’ll continue to break this down. But don’t be embarrassed if you’re confused because I spent weeks trying to figure out this whole pathway. And actually, it’s three different pathways that overlap. Yes, it’s complex. I will admit this, but it is an important topic and we want to try and make it as simplified as possible. And I will share with everybody — if you’ve heard of folic acid as you probably see it in some fortified foods or you’ve heard of folic acid. Folic acid is the manmade version of folate. So that’s an important distinction to make. And these biochemical pathways in your body do require a lot of B vitamins. Tracy, you mentioned B12 and folate, which are both B vitamins. It also requires Vitamin B6 as well. So B vitamins are very important to this topic. And genes are an important part of this conversation too! The genes and their respective DNA code for the enzymes (such as MTHFR) in these pathways to do what needs to be done. So why don’t you tell us a little bit about how the genetics piece comes into play here? I think the key thing I want to say about all of that is first, we just talked about methylfolate and methyl B12 as being substrates or substances to help a necessary reaction happen. If you give somebody methyl B12 or methylfolate (5 MTHF), each will pass off their methyl group to whatever comes next in the cycle. That’s why you’re even taking them. And the end result of giving somebody methyl B12 or methylfolate is so they can either make SAMe, which does important work for your body, or that we can go down another pathway and make some glutathione. But it is a complicated subject and don’t feel bad if that doesn’t at all make sense. I listen to this stuff ad nauseam. And still it’s complicated… it could be a full-time job. For genetics, I think some really basic stuff for people to understand as we move forward is that there are things called SNP. It stands for Single-nucleotide polymorphism. It’s just a change in the gene sequence. It means that the parts in the gene got mixed up. They’re still all there, but they got scrambled up. And the big ones you hear about in regards to MTHFR are the C677 SNP and the A1298 SNP. You hear about those a lot in the popular press. And then Amy Yasko really talks about the MTHFR O3, and it’s just as serious as the C677 SNP. To be clear, a SNP is not a mutation. It’s very similar to a SNP though and people tend to understand the word mutation when they’ve never heard of single-nucleotide polymorphism. So the words get used a little bit interchanged. Technically, what we are talking about are SNPs. The genes just got scrambled and so they act a little a bit differently. But it’s not serious enough to cause something like Downs Syndrome. You can also have multiple SNPs. If you have one SNP, we call it a heterozygous (hetero) SNP. If you have two SNPs, it would be called a homozygous SNP. And then you can have a SNP in both the C677 (MTHF) and the A1298 (MTHF) and that’s called a compound hetero (because it’s one hetero SNP of each). So again if you’re a homozygous C677 (MTHF), it means two of the genes are in the wrong order. Because of this, that enzyme produced from these genes now only works at about 18 to 22% of capacity. It’s a little bit like trying to win the race when you have a broken bike. You’re definitely not at full speed. Most of the SNPs are down regulations, meaning that they operate at reduced function. But the CBS SNPs (which regulate the enzyme that sends Homocysteine down the Transsulfuration Pathway) tend to be at an up-regulated (meaning it works faster than normal) and that’s not necessarily good. If you think of two conveyor belts and the first conveyor belt is going along and it’s going to meet up with conveyor belt number two, but it’s running way too fast, then the other one is just at regular speed, it’s just dumping things in. How that shows up in the body is a little bit like having a hole in the boat. People with CBS SNPs take in a lot of nutrition and it just keeps leaking out. The pathway is running so fast that it just dumps out the other end. Jennifer: So you may have one or several of these SNPs in your genetic code. I have a friend actually that found out that she has one of these SNPs, but the point here is that it is important to find out what you have. But I think that the MTHFR gene gets talked about a lot as a genetic defect or enzyme problem. I think the way that it’s talked about on almost every single popular blog and even the small blogs is incorrect. It’s not that the science is bad. It’s due to an oversimplification of what’s going on in a complex biochemical system and simply blaming everything on this one little SNP affecting the MTHFR enzyme when in reality, these cycles, as you can see in that graphic above that we have shared with you guys, is a lot more than MTHFR. And I think that while it might seem great to look for a magic bullet of what’s going to help you feel better… and granted some people do feel better… but Tracy, you had mentioned to me that some people don’t do well addressing an issue with MTHFR simply by taking methylated vitamins. Not everyone responds well to them even though they are unendingly advocated for on many blogs covering this topic on the internet. Why do you think that everyone is talking about MTHFR? Tracy: If I just look back at my own history, the very first time I heard of MTHFR, it was in an eight-hour podcast in November 2011. It blew my mind. I started testing for the MTHFR SNP because it was available back then. Almost every single one of my patients tested positive for either the A or the C or a combination of both. And I could look at their chart and start looking for things such as varicose veins or estrogen dominance or cancer in the family or even autoimmune diseases. All the things that I was taught to go along with this, and that’s all I knew at the moment. It started there. And then I had two patients in the year that tested negative for any MTHFR SNPs. And yet, in all the research that I had done, I knew that there could be other SNPs involved. Eventually, I ended up digging deeper and reading Dr. Amy Yasko’s books, and going to trainings… like Dr. Bridget Briggs just did a three-part training. But what doesn’t get talked about is that this is multiple relay races going on at one time with MTHFR being in the center, but he’s passing off that methyl group over to the methionine and then it can end up down at glutathione and SAMe. But also, if he just turns around and hands off the methyl group a different way that’s how we make our amino acids and neurotransmitters like serotonin and tryptophan. What I’m trying to say is it affects a lot of different pathways. It’s very complicated and it takes time for medicine to change. In the average community, most people here, where I live in Montana, probably still don’t even know what MTHFR is, let alone understand that there are other SNPs, like COMT, CBS, and SUOX. I could give you the whole list of other SNPs involved. And that’s what actually makes this so dangerous is if you just start giving the whole world methyl B12 and methylfolate, you can make some people very sick. Don’t forget that those people with the CBS SNP, they have a hole in the boat. You can give them methyl B12 and methylfolate all day long, 24 hours a day, and they’re just going to drain it out in the hole in the boat. And then there’s a SNP called COMT, and those people can’t chew up methyl groups very quickly. If you think of COMT like a Pacman, well, he’s really slow. (So they are sensitive to outside (exogenous) source of methyl groups). Don’t forget that most SNPs are down regulations. So if you give somebody with two or four (SNPs) or a double homozygous COMT a bunch of methyl groups associated with their supplements, their Pacman chews up that methyl group really slow. This causes you to become over-methylated and can result in them feeling very anxious and nervous, and can give them panic disorders. And beyond what I even am very comfortable talking about. I watched a guy named, I think, Dr. Phil Walsh, who talked about people who are over-methylated and under-methylated. And you can be both. He had a list of signs and symptoms of people who just naturally can be over-methylated (because of the combination of their gene SNP”s even without supplementation). Just because you’re double C677, which is what I am – a double C677 – so my MTHFR enzyme functions at about 20% of normal capacity, we can’t assume that I’m under-methylated because we have to consider those OTHER genes. I am also a double (homozygous) COMT, so I don’t deal with methyl groups very well and I actually can end up over-methylating very easy. Does that make sense? I wasn’t planning to share that, but I think it’s really important to make the point that you can’t just give the whole world methyl B12 and methylfolate and instantly solve their methylation problems. Jennifer: It does. And I think this underscores the more universal rule of why supplementation has to be incredibly individualized. And you can’t just look on the internet and find a solution that worked for one person and assume it’s going to work for you. Because if your head is swimming and mind you, this is a science-y, nerdy conversation, I admit it. It’s a much more science-y than we typically have. But this is just skimming the surface. If you go deeper and start delving into all the other genetic pieces, and you don’t know any of this, you don’t understand biochemistry, you don’t understand the implications of what may happen with certain SNPs and whatnot, you can really harm yourself. So again, this underscores why you have to find a practitioner, if they’re going to treat you for this problem who understands it and knows how to do the testing as well as the proper approach. One solution is not going to fix them all. And that leads us to a question. How do you get tested for this, Tracy? Tracy: There are a couple of ways. You can check out Dr. Amy Yasko, and she’s the queen of this. She started all of this and she understands this biochemistry more than anybody that I have ever known of. She offers her own tests which I believe are $400 to $500. Then she will guide you through this process of what to do, what supplements to take, what tests you need to take. Even before they got in trouble, I thought that was crazy. I could easily get breast cancer. If I want to smoke and drink and stay up all night and eat hydrogenated foods, I could easily get breast cancer. Anybody could get breast cancer. You don’t have to have the gene to get breast cancer. In fact, most people who get breast cancer don’t. But all that said, 23andMe is not out of business. They’d still give you your genetics. You just get a huge zipped file and you have to know somebody who can help you interpret it. Like you said, Jennifer, it needs to be somebody trained and somebody who knows more than just MTHFR. If somebody is advertising on their website that they’re going to help you with your MTHFR gene and they don’t mention CBS, SUOX, MTR, MTRR, or the 24 or 25 other genes that all “talk” to the MTHFR gene, they don’t know what they’re doing in regards to the complete picture. I study this all the time and I often feel like I don’t know what I’m doing. That’s just the honest truth. No two people are the same. We know that from twin studies, even when you have two identical twins and you’re looking at the same set of genes, one twin could get an autoimmune disease and one twin is not going to get autoimmune disease. And that’s because what we do, all those choices we make on a daily basis influence how those genes are getting expressed. One more point about this in regards to getting back results that do show SNPs, for example just because you’re a quad COMT – that’s what I call myself – or an MTHFR C677, it doesn’t always mean it’s a death sentence. Don’t assume in all of this that just because you have a SNP it means that you’re doomed because obviously, I function every day. Our genes make up 25% of our risk of disease and then how we manage our sleep and our stress and our diet, exercise influences how those genes get expressed. In our other podcast, we talked about how you can look at different factors that might suggest you could develop any type of autoimmune disease. And there are other things that are beyond the scope of genes. But maybe the genes will give you an indicator, a warning or a heads up way ahead of time. I think that it’s good to have a picture, but it’s not to say that it’s set in stone. We all struggle with some sort of health problem. Many of us have autoimmune issues, some of us are dealing with celiac and whatnot. Why should you care about this? Tracy: If we’re going to look at the whole methylation properly and not just the MTHFR gene, but that whole complex cycle (Image is above), having SNPs in any of these places disrupts normal cellular function. It’s like trying to go through life and you only have 70% oxygen to breathe or you don’t get enough hydration. It truly interrupts the functioning of the cell. Then this lays the groundwork for chronic disease. When I went through my charts and tested people for MTHFR back in 2011, and only two people were negative, you start to see the significance. Obviously, people who have MTHFR and other SNPs are the people who do ultimately get sick because you can’t methylate, and then you can’t make SAMe as well, and then you can’t make your DNA so you can’t repair your gut lining, or cell membranes, or support your immune system. It’s off balance between the humeral and the cellular immunity. They can’t detoxify as well. And so these are the people who get sick. And for those who already have celiac disease, they have one autoimmune disease, I did the podcast with Jennifer about predicting autoimmune disease. And stated that if you have one [autoimmune disease], you’re statistically at risk for getting more, up to seven in your lifetime. If you don’t optimize methylation, meaning all of these pathways, not just MTHFR, but optimizing the whole set of genes that MTHFR talks to, then your immune system is still off balance and it just makes you more at risk. Why anybody with a chronic disease would care about this because it really comes down to root causes. 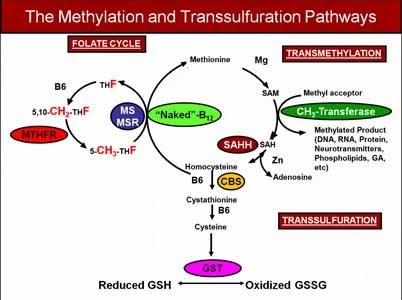 I don’t think at this point you can throw me a health condition and I can’t trace it back to this methylation pathway. It really is like not having enough oxygen and trying to get through life and run a race. And you just don’t have the capacity to do that well. And over time, people get sicker. If you think about being homozygous C677, in my case, I didn’t have a fabulous health as a kid, but I wasn’t sick. Now I can certainly see if I don’t optimize my methylation by the time I’m 70 or 80 or 90, and you have all those years cumulatively adding on top of each other, I can see how people get multiple chronic diseases because things aren’t working well. Is there any general dietary or lifestyle suggestions that they could do to help themselves, like any foods in particular they should try to avoid? Anything you found that’s helpful that maybe they might not know about? Tracy: Sure. Remember I said that we need SAMe to detoxify our estrogen. So we all have some, even men have estrogen, of course. So we need to get rid of it, right? We don’t want it to circulate round and round. In order to detox estrogen, we methylate it and it goes from 2-hydroxy estrogen to 2 methoxy (methylated) estrogen. It gets methylated in phase 2 of the liver and then it leaves. And that’s what we want. We don’t want estrogen to hang around and stay in circulation over and over again. Stress interferes with that pathway. So yes, ultimately, managing stress is important. Another lifestyle thing that plays into all of this is that some of these people can’t detoxify very well. So it becomes once again, the same messages I say over and over, it’s really important to eat organic, to get your mercury amalgams out, to drink filtered water or spring water. Do you know what I mean? Avoid BPA and phthalates – those are endocrine disruptors (or fake estrogen). The last thing I need in my life is fake estrogen because I can barely get rid of the estrogen I have, let alone fake chemical products like BPA and phthalates. A lot of the things still come back to all that healthy lifestyle and getting enough sleep, drink enough water, eat organic whole foods, perhaps do some juicing. Or even if you drink green juices all day, you still have to be able to methylate that folate, right? And so, we do need some help and that’s what this is all about. It’s supporting the broken pathways so that with some methyl groups or some active methylfolate. Again, if I just keep using myself as an example of a double C677, I can’t methylate folate very well. And just to help people with the visual, I could drink spinach, orange juice, fresh green juice, all day long which would be full of folate. But I can’t methylate it very well making it difficult for me to use what I’m eating and drinking here in this example. So that is where methylfolate comes in. But again, the only answer is not just to give methylfolate and/or methyl B12. The other thing that happens in all of this is that just because you have genes doesn’t mean it will express as such. And so it’s also really important to work with somebody who can order you some lab tests. And you find out what you’re homocysteine is or your taurine, or your level of sulfates and ammonia. All of the genes have indicators. So I have a quad COMT and I’m super task oriented and I want everything done yesterday. My husband is a quad COMT. He has a different set of genes. He does not have SNPs for CBS or C677. His genes express completely different and he’s the most laid back guy you could meet. So again, just looking at just the MTHFR gene isn’t the whole story and it’s really important to not treat it based on individual genes, but to do some testing and find out how your genes are expressing in real life and look for actual markers. Does that make sense? Jennifer: It does. And Tracy, I just wanted to specify to everybody that’s listening too. This is a lifelong issue. This is not something that you’re going to take some supplements and then six months, you’re good to go, and you can just forget that you had it. You’re like, “Oh, yes. I had that MTHFR thing, but it’s all good now.” Right? Tracy: Yes, it doesn’t go away. You’ve got to really be mindful of all these things. And as we said, and I cannot stress this anymore, you have to find somebody that understands how to work with this problem. You can’t read the articles on the internet and assume that one approach or one or two supplements are going to solve your problems. That’s probably not a wise idea. Tracy: I couldn’t agree more. When I agreed to do this talk with you, it was one of the biggest things I wanted to get across is that there are always other enzymes (SNPs) which have roles. And again, just to be clear that as a double homozygous C677 MTHFR, I need methylated groups, but I don’t tolerate methyl groups very well. Because as a quad COMT, meaning I have four SNPs in my COMT, my important genes there, I don’t handle methyl groups well. So on one hand I need them and on the other hand I don’t handle them and it’s a very tricky balance and back-to-back lab testing. Once you get your genes and you find out where you’re at. So I run certain tests to identify people’s values for all those pathways and so, “Oh, your homocysteine is 4 or it’s 12.” Or your methionine is low or high. And I can see where the broken pieces are and then supplement accordingly. But it’s true… your genes never change and even if you optimize your methylation and then, God forbid, you go through a divorce, or you lose your spouse or some tragic thing happens, you have to optimize your methylation again. It’s not a static thing because all of our dietary and lifestyle choices affect all these processes. So it’s a forever thing but also, you think about what methylation does and it opens the door to autoimmune diseases and bipolar and mental health and estrogen dominance, fibromyalgia, chronic fatigue, things that people on this call are dealing with. Everybody knows somebody who has a fatigue issue or has a runny nose because of too many histamines. We all know somebody this affects. I told you there’s not a health condition you can bring me that I can’t bring back to methylation. Not that I always know how to fix it, but I can guarantee you that methylation plays a role in optimizing these pathways and does make people feel better. Jennifer: Tracy, I feel like we’ve talked about so much and yet, we’ve really only touched on such a tiny minute piece of the picture. But I hope that the messages and the ideas here will help either jumpstart someone’s process and looking to what might help them feel better or it will give them insight into a condition they already know they have and perhaps, help them rethink some of their approaches. Because a lot of times, as you said, that what’s the way for somebody else will leave you feeling horrible. I really appreciate your time and I wanted to direct everybody too. If you have yet to connect with Tracy, you really should. And wonderful resource. She has a free Heal Your Leaky Gut Guide over on her website at HealthyLifestylesMT.com. She has some Get Acquainted sessions that are available to you. If you’re looking for help with this issue or any others as well as a newsletter that you can sign up for. Thank you so much Tracy for joining us! Tracy: You are welcome, Jennifer. I’m happy to be back and just thanks for having me. Good luck to all of you out there in this process. Jennifer: You’re very welcome. Please leave your questions and your comments below. Do you have the MTHFR defect? Let us know. I’d love to hear from you as well as how it expresses in you and what you have learned. And if you feel that some of the things we’ve talked about are really valuable, what are you taking away from the conversation? What is it that you’d love to add to this conversation or hear more about? We’d love to hear from you. Again, thank you guys so much for joining me. I really appreciate it. I hope you have a fabulous day and I look forward to seeing you the next time. Bye. Hi Shannon! Yes this is a really complex topic and one that you can’t JUST look at the MTHFR enzyme and say that’s your problem. The different types of SNPs you could of MTHFR have differences in how their function is reduced. One of my biggest grievances was that just because someone may have the MTHFR mutation doesn’t necessarily just mean that you could have low glutathione. There are plenty of other enzymes which could also have mutations that could cause bigger issues. That’s why I get upset when most blogs I read say “if you have MTHFR, you should supplement with methylated B vitamins”. As Tracy points out, that blanket statement could really cause problems for some and make them sicker than before. Thank you for sharing your thoughts and checking this out! that has now become angioedema, presumably caused by PRN opiates. Opiates removed, still swollen eyes continue.All these symptoms manifested after adding methyl B vitamins. Hmmmm. I recently added Sam-e 800 mg and feel better with less anxiety and depression. Now I wonder what to do? I am on my journey and really appreciated the technical content and perspective. I have a background in science so found it very helpful to gain a greater understanding of this particular topic. As always, also enjoy your guests, too! Thanks for providing valuable content. I have homozygous c677 and was given methylfolate 1mcg and have been trying to add the B6 and B12. I can tolerate the methylfolate but the B vitamins make me feel horrible and I don’t really know if the methylfolate helps. I am morbidly obese, I have no energy. When I was 18 I was a college athlete. Now I can barely walk to the end of the street at age 38. I have anxiety and panic attacks. Do you have advice as to what I should be eating? I struggle when i eat melons, cucumber, garlic, and onion. I am getting off my last medication- valium, which makes me feel horrible. I want to be able to function and be more active. I have been down the medication path. I have tried the vitamins from the naturopath and take magnesium, fish oil, and methylfolate. I am desperate for help. Thanks for the information you provide. I just want to know what I can do without vitamins to help myself as I think they may not help and may exacerbate the anxiety. Thank you. God bless. Hi Jennifer, Thanks for writing in! I unfortunately do not have any resources like that here on GFS. Have you checked out Dr. Ben Lynch’s site to see if he might have something? His URL is http://www.drbenlynch.com/. I’ll keep this topic in mind to share for the future. I totally understand and sympathize in wanted to not have to rely on all nutrients from supplements. Thank you for all the info, unfortunately my head is swimming after reading all that! I’m positive for one copy of the heterozygous C677T and my husband is positive for compound heterozygous C667T and 1298C. What advice can you give to us? We are trying to decide what, if anything, we need to be taking. I will add, that the Dr. that found my C667T put me on MethylProtect, B12 sublingual and S- Acetyl Glutathione but didn’t put my husband on anything. Should I keep taking those supplements? B12 really doesn’t make me feel anything. Can you advise? Hi Julie, it’s really not appropriate for me to recommend any supplements in this format. MTHFR is a lifelong genetic issue that must be individually reviewed. First, I’m not well versed enough in this area to say whether that’s even a good idea. And secondly, you really should see someone to consider the entirety of the Folate and Methylation cycles as well as the Transulfuration pathway to make sure that adding in any supplement like that would 1) help you and 2) not cause more harm. SAMe is converted to homocysteine. You could potentially end up with a build up of homocysteine if the methyl donors aren’t available to convert it to methionine. So again… I’d find someone you can work with who can review your records and labs as well as account for other potential genetic SNPs so that you can get personalized recommendations. Otherwise, it’s like shooting darts in the dark and potentially causing more harm than good. Both my daughter and I have an MTHFR mutation. I am heterozygous C677 and A1298. My five year old daughter is homozygous C677. She has delayed cognitive development (especially as it relates to her speech) and has drug resistant absence seizures. Do you think her development delays and/or seizures are related to her mutation. I should also mention that she and I are 5 weeks gluten free and we have seen huge developments in her speech starting about 10 days after the elimation of gluten began. My head is spinning from all of the information out there. I am desperate to help put an end to her seizures and allow her brain to develop at a normal pace. I will never stop fighting for her but I desperately want to know where to focus my energy. Hi Erin, it’s possible, but I’m not well versed on this enough to be able to give you a good answer. That said, it’s very positive to hear that she’s feeling better being GF. Since you know of your mutations, have you tried finding someone to work with who may be able to check her various levels and support her nutritionally? I am just at the beginning of my journey and understanding the gene mutation along with my naturopath and acupuncturist. I have changed my diet to a whole food and following the recommended vitamins and minerals..thank you for such an informative podcast. I look forward to delving deeper into my genetics that have been plaguing my family for years and making us real sick with autoimmune diseases, despite healthy lifestyles. I think everyone here misunderstand what compound for MTHFR C677T AND A1289C really does mean. If one is compound for this genoset it means that one SNP polymorphism is on the gene you got from your mom, and the other one is on the MTHFR gene you got from your dad. Both MTHFR gene then will have an fault, and your methylation WILL be affected for sure. Cant see that this is clear in this website. The most common genoset you can have with both polymorpisms (677 and 1289) is that this happens ONLY in mom OR dads MTHFR gene. This is a better variant because you STILL got en healthy gene working full time doing its job. So everyone saying they are compound may not be true if you not have checked that out spesific. Hi Bernhard, thanks for sharing. No one is disputing this, however even if you only have 1 SNP (say from mom OR dad), you may still have an issue with the efficiency of MTHFR. There’s certainly no guarantee either way that the enzyme will work sufficiently or less than optimally with only 1 SNP. That’s why upon discovering that you have one or two SNPs, you should do functional testing (such as a urinary organic acid profile) to see if any functional lesions exist that would require supplemental support. I am having a a terrible time finding a (somewhat) local provider who is well versed in the area of MTHFR mutations. Is there a list that you know of? or any recommendations within Illinois? I do not unfortunately know of a list. Ben Lynch might have something on his website, but I have no idea. The key is to find someone who really understands it. Have you tried looking at the Institute for Functional Medicine’s website for a practitioner? I just had a chance to listen to this and I found it very informative. I also have MTHFR mutations (3 of them, which I have been told is rare; 2 C677T and 1 A1298C). I have done a lot of reading and so far have not found any information on having 3 mutations. Is there any info you might be able to give me about this? Anything extra I may need to worry about? Hi Tiffany, I’d check out further information from Dr. Ben Lynch. I do not have anything to recommend here based on what you are sharing. BUT I will tell you that you’d be better off looking for a physician very well-versed on Methylation who can work with you privately on your unique case. It’s not ideal to attempt to piecemeal information about your case from someone online who doesn’t know your entire case which is important to consider before giving you recommendations. Wishing you luck on your journey! Thank you so much for this article. You really brought some things to my attention that I hadn’t considered before. I’ve known that I have compound heterozygous C677T + A1298C MTHFR for a few months now, and I’ve come to understand much of the mechanics and different things it can cause (I believe it’s causing my PCOS), but I didn’t think about how the treatment would be different for the different snips you have. As of right now, I’m trying to avoid folic acid (it’s hard especially when I eat out which luckily isn’t often) and I’m taking a methylated form of B12. My doctor had me doing the B12 long before she tested me for MTHFR. Now I know to look and see what is the best treatment for my body. Hi Sherry, I appreciate your question, however due to the complexity of your health situation, it is highly inappropriate for me or anyone else who is not intimately familiar with your case to make supplement recommendations. The reason is that methylation is a delicate balance and what may work for someone else can cause adverse effects for you which can include disturbance in mental and emotional well-being. There are a variety of factors to consider as well in balancing methylation appropriately. Additionally, you can have a B12 deficiency for a variety of reasons and it should be addressed sooner rather than later as prolonged B12 deficiency can result in permanent nerve damage. The only advise that I can give you is that you should work with a practitioner directly on this issue to avoid any potential side effects from recommendations that aren’t personalized to your particular genetic SNP and other health circumstances. Thank for all the information. A few years ago I asked the Dr. to order a test for MTHFR. The results were “Positive for one copy of the C677 Variant and one copy of the A1298C variant.” The test interpretation included: “This individual is compound heterozygous for the variants, C677 and A1298C in the MTHFR gene. This result is not associated with a significantly increased risk for coronary artery disease, venous thromboembolism, or adverse pregnancy outcome. This assay cannot determine whether these two variants are on opposite chromosomes (trans) or on the same chromosome (cis).” When my PCP looked at the results she said that since I was heterozygous I was not at risk. No diet, or over the counter meds were suggested to me. I was not able to find a PCP that could help me interprete the results better than that. Can you explain to me what the results mean to me? Hi Mary, the only way to know IF you have an issue with the methylation pathway is to test the functional capacity of the pathway via organic acids. That will help to tell you if you actually are having an issue and need additional support rather than solely relying on the genetics. If you’re interested in looking further into this, I’d recommend scheduling a consult to discuss this privately. Methylation and genetics are very complex and highly individualized and require more information than just what you’ve provided herein.